Linguistic Syncretism as a Marker of Ethnic Purity? 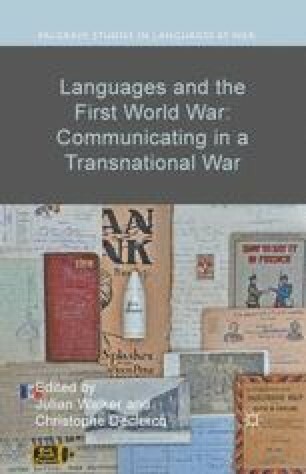 To say that the First World War was an important moment for the history of language relations in Belgium is nothing less than an understatement. Even though not all historians nowadays subscribe to the older theory that this war caused the split of the country between two largely autonomous and unilingual entities — a Dutch-speaking or Flemish one in the north, a French-speaking or Walloon one in the south — not one among them would contest that it deepened the existing tensions.1 Indeed, the political and military situation of the country during the war gave rise to a set of elements which turned out to be explosive during that period, but became even more so after the war. At the front line itself, the social conflict between the highly educated officers and the scarcely literate ‘ordinary’ soldiers was readily interpreted as a linguistic conflict: whereas Belgian officers were almost exclusively Francophone, a majority of the soldiers spoke only a Flemish variant of Dutch. The group of mobilized flamingants (advocates of the Flemish cause) who protested against this situation soon came to be known as the Front Movement. ‘Piccaninny’ (1911) Encyclopædia Britannica, 11th edn, vol. XXI, http://en.wikisource.org/wiki/1911_Encyclop%C3%A6dia_Britannica/Piccaninny [accessed 8 June 2015].